Do you need a magical gown for a magical night? We can help you find a dress that dreams are made of! Women and girls come to us from all over the US because we have thousands of formal gowns from the top designers in the bridal, pageant, and prom worlds stocked floor to ceiling in our mega-store. From Sherri Hill and Jovani to Mori Lee and Tarik Ediz, we have the best in formal evening gowns. Take a deep breath! Our showroom can be overwhelming but our consultants really do make shopping here an amazing experience. 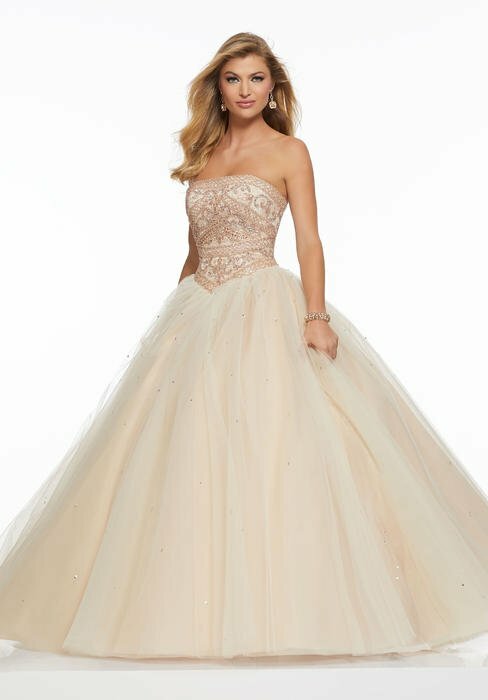 You walk in with a vision of your perfect formal look in your head - whether you're all about that princess vibe, Hollywood glam, or dark romance - and our style experts will find the formal evening gowns and cocktail dresses that turn your dream into reality. Going to a big event? Then you need to shine! Knowing the dress code is absolutely step one when you're shopping for homecoming, winter formal, or prom dresses. What works for an evening wedding may not be right for prom, and when you're shopping for your next pageant? You'll need something else entirely! Knowing your personal style is step two. Do you feel like a million bucks in a sleek and simple sheath or is your go-to formal look all glitter everything from head to toe? When you're shopping formal gowns, look for dresses that not only are gorgeous on the hanger, but also make you feel gorgeous the second you put them on. Finally, think about color. If you live by the trends, look at the hot colors for the season of your event and choose from that palette versus today's color du jour. But if you're dressing for a pageant, talk to your style consultant about how you can use the winningest colors to your advantage. Inspiration is everywhere these days. You'll find ideas on the runways, in the awards shows, and on fashion blogs. Put together an Instagram collection or Pinterest board of your favorite formal looks before you come to PreVue. Your mood boards will help you refine your personal style and get a sense of the styles, cuts, and colors of formal evening gowns you'd like to try on first. But keep an open mind. The best part about shopping with one of our consultants is that they've dressed thousands of women and girls for events, pageants, and proms - so they really know what looks good. Be ready to try on dresses that you never would have grabbed on your own because that one dress that makes you feel like a star may surprise you! Quick answer: you're going to leave with your dream dress! PreVue Formal and Bridal is the largest bridal and formal wear store on the West Coast. We have 16,000+ formal gowns by top designers in stock right now, and we have consultants who won't stop until you find THE ONE. We understand that shopping for formal gowns can be a process, but PreVue is the one stop shop with everything you will need for your next big event.